In the most general terms, the function of the Organization for Security and Cooperation in Europe (OSCE) is to prevent conflicts, manage crises and contribute to post-conflict rebuilding, including safeguarding human rights. Its activity is primarily based in countries in south-eastern and Eastern Europe, the Southern Caucasus and Central Asia that fall short of many democratic criteria and which are experiencing problems in various fields. The OSCE missions vary in terms of their mandates (there are permanent and observer missions, field operations etc) and the level of achievement has also fluctuated. The OSCE has also been an intermediary of meetings in regional formats the 5+2 process to resolve the Transnistria conflict or the Minsk Group for the peaceful resolution of the Nagorno-Karabakh conflict. In spite of years of talks, no noteworthy progress has been achieved and the main reason for this is the actions or lack thereof on the part of Russia, a full member of OSCE. State-building has been a more arduous process in Ukraine and the OSCE mission came to the country in 1994 to stay there. Until 1999, the mission operated in Crimea, and from that point on up to the present, the OSCE office in Kyiv has implemented a very diverse array of projects. As the Ukraine crisis escalated, the OSCE decided on 21 March 2014 to establish a special observer mission in Ukraine (SMMU) and send the first 100 civilian observers to 10 cities: Kyiv, Lviv, Ivano-Frankivsk, Chernivtsi, Odessa, Kherson, Kharkiv, Dnipropetrovsk, Donetsk and Luhansk. As customary, this was done at the behest of the host nation and the decision was adopted unanimously by the OSCE permanent council. Actually, Ukraine wanted the OSCE observers’ mandate to extend to the Crimea. All the other OSCE member states besides Russia agreed to this. In Russia’s case, it issued a statement already when it acceding to the decision establishing the mission that the political and legal reality must be taken into consideration, the reality stemming from the fact that Crimea and Sevastopol had become integral parts of the Russian Federation. Indeed, that same day 21 March Russian President Vladimir Putin ceremoniously signed a law formalizing the annexation of the Crimea by the Russian Federation. Already in early March, let alone later, OSCE military observers were not allowed on to the peninsula– warning shots were fired in their direction. By that time, the weather maps on Russian evening news already showed Russian territory extending not just to Crimea but into the Donbass and Kharkiv. The OSCE mission lists its goals as assisting and supporting Ukraine, reducing tensions and contributing to peace and stability. 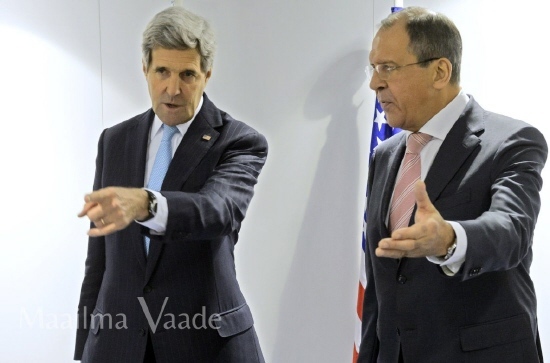 At the same time, the OSCE observers and leadership must remain neutral. The language used by the OSCE refers to a conflict and less frequently to a Russian intervention. In any case, there has been an attempt to avoid the organization taking any kind of position and based on its mandate it gathers solely information on the security situation. As the words of Putin and the Russian leadership and the events in eastern Ukraine are clearly in conflict and the OSCE observers have reported that heavy weaponry from Russia is being transported to separatist controlled areas in eastern Ukraine, the OSCE’s statements have also grown bolder. In early November, Chairman of the OSCE Parliamentary Assembly Ilkka Kanerva admitted that the Minsk accord signed in September was rapidly losing importance due to the continuing battles in eastern Ukraine. Nor did anyone prior to that point believe in a lasting peacekeeping agreement. As with every international organization, the OSCE and its leadership consider its reputation important. Ultimately, it is the world’s largest regional security organization, with 57 members, including the US: Observers from more than 40 countries have been sent on the mission. It would be true accomplishment if the adversaries could be reconciled –fighters from Russia and Russia-supported separatists on one side and Ukrainian government forces on the other. Mission impossible? A priority for the OSCE is to expand the mission in eastern Ukraine. It plans to increase the number of observers to 500 or more. Understandably, the focus is aimed at the Donbass the self-proclaimed People’s Republic of Donetsk and Luhansk. At this point, the security issue comes up. It is no secret to anyone that what has been going on since March is a shooting war. Head of mission Ertuğrul Apakan has repeatedly called on the “parties to the conflict” to ensure the safety for the OSCE observers to go about their business. There has been talk of issuing the OSCE observers equipment and vehicles appropriate for the high-risk conditions armoured vehicles would be necessary. It is a wonder that there have not been more deaths among observers than the one Red Cross worker killed in Donetsk in early October. The observers in Donetsk mainly have military or police backgrounds, but for understandable reasons they are unarmed. to meet local partners and study the situation on the ground, the observers make regular patrol tours of cities and villages in their area of responsibility and the border. Three teams endured a hostage ordeal. There have been many more short-term detentions. As we learned, the Estonian observer who was abducted, Tõnis Asson, drew the attention of his team repeatedly to the security risks before his team of four was captured in Donetsk oblast., The Ukrainian Ministry of Defence has expressed clear dissatisfaction in connection with the fact that Russian observers are also participants in the mission reportedly information on the locations of Ukrainian forces was being conveyed from the Mariupol area. Naturally, such a decision from the Security Council was impossible, as Russia is a full member and thus has veto right. Instead, Putin urged Ban Ki-moon to have the UN condemn what Putin called the Ukrainian government’s use of force against the residents of the south-eastern part of the country. Thus the blame was shifted on to the Ukrainian government, whose action, it was claimed, prevented UN Charter Article 7 from being exercised and made the formation of a UN peacekeeping contingent unrealistic. At the same time, Russia has continued to press into Ukraine under the guise of peacekeeping or humanitarian missions. Just as the term “peacekeeping” was openly used during the Georgia War, Russia conceals the fact that Russian units were taking over Ukrainian territory. Russia has also called for a UN decision to send Russian peacekeepers to the shootdown site of the Malaysian passenger plane, which lies in a separatist-controlled area. Ironically enough, the UN instead expressed concern over the use of UN-marked helicopters by Ukrainian forces in the Donetsk area. Russia had protested over this. These were in fact helicopters leased from the UN that went into use when Ukraine decided to pull its personnel out of the UN missions. Sending UN blue-helmets would undoubtedly have reduced the suffering of the local population in eastern Ukraine. Kyiv would have been able to attend better to the country’s economy and consolidate the ranks of its Defence Forces. Putin would have had a face-saving opportunity to pull back and even let his propaganda machine serve up the situation as a Russian victory. Unfortunately this scenario is clear wishful thinking. The plan to carve out a Novorossiya seems to be going ahead at full steam. 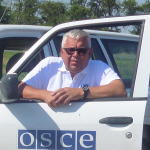 I was based in Kherson as an OSCE observer from May to the end of September. During the summer, the population felt that the situation in Kherson oblast was calm but the phrase “so far” was often tacked on. In September, the general atmosphere became much tenser with escalation of the fighting in south-eastern Ukraine and the threat to Mariupol. A separatist attack was not expected to come from the direction of Mariupol, which is several hundred kilometres away, but from the much closer Crimea. According to Ukraine’s information, 23,000 troops were massed on Crimean territory already in July and the forces can only increase. A direct road to Mikolayiv and on to Odessa already goes through Kherson city and oblast. The attitude of Ukrainians toward OSCE observers has predominantly been friendly, at least on the outside. Local officials do not tire of repeating that the fact that there is an international presence is important, like the fact that there is an interest in what is happening in Ukraine as it helps form an objective picture. In broad terms, though, nationalistic Ukrainians are disappointed in the Western response. Quite a few of them declare resolutely that only the intervention of NATO forces could lead to a solution, even though they understand that this is an unrealistic.